HomeHistory of The Gift of Life, Inc.
A BRIEF HISTORY OF THE GIFT OF LIFE, INC. The Gift of Life, Inc. was originally initiated by Rotary District 7250 in 1975, and is today a worldwide International Service Program. Its primary purpose is to help those needy children who require corrective heart surgery secure another lease on life, through the miracle of open-heart surgery in a Gift of Life participating hospital in the United States and abroad. The program reaches out to children throughout the world, including the United States. It is a not-for-profit, tax exempt corporation whose Board of Directors and members are Rotarians of Brooklyn, Queens, and Nassau County in New York, and members of local ethnic organizations. The concept of the Program began in 1974 when the Manhasset, NY Rotary Club responded to a request for help from the Kampala Rotary Club in Uganda. The response brought five-year old Grace Agwaru on a 5,000 mile journey from Uganda to Roslyn, NY. On November 15, 1974 she underwent a very successful four hour open-heart surgical procedure to close a hole between the two lower chambers of her small heart at St. Francis Hospital in Roslyn, NY. Strange as it may seem, what began as a simple response to help one small girl from a far-away country, has today developed into a very dynamic worldwide movement, involving not only thousands of Rotarians and their families, but also countless people from other community-based service and fraternal organizations, including numerous American ethnic community groups: They all have united with the primary objective of providing the "Gift of Life" to the more than 10,000 children from over 60 countries who have followed Grace Agwaru since 1974. Children with life-threatening cardiac disorders, ranging in age from infants to eighteen years, have been sponsored by Clubs and Districts throughout the Rotary World. They have come from such countries as Afghanistan, Azerbaijan, Belize, Bolivia, Brazil, Cambodia, Chechnya, China, Columbia, Dominican Republic, Ecuador, Egypt, El Salvador, Ethiopia, Galapagos Islands, Georgia, Greece, Grenada, Guatemala, Guyana, Haiti, Honduras, Hong Kong, India, Indonesia, Iraq, Ireland, Italy, Jamaica, W.I., Jordan, Kazakhstan, Kenya, Kosovo, Malaysia, Mexico, Mongolia, Nigeria, Pakistan, Palestine (Gaza), Panama, Peru, Philippines, Poland, Portugal, Romania, Russia, St. Kitts, South Africa, South Korea, Sri Lanka, Tadjikistan, Trinidad, Uganda, Ukraine, Uzbekistan, Venezuela, Yugoslavia, Zaire, Zanzibar, and Zimbabwe. All have been accompanied by either a parent or guardian. 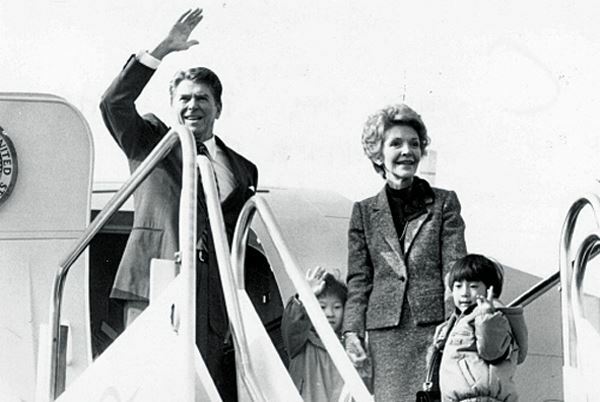 Pictured above are President and Mrs. Reagan bringing two children from South Korea to the United States for lifesaving surgery through The Gift of Life, Inc.